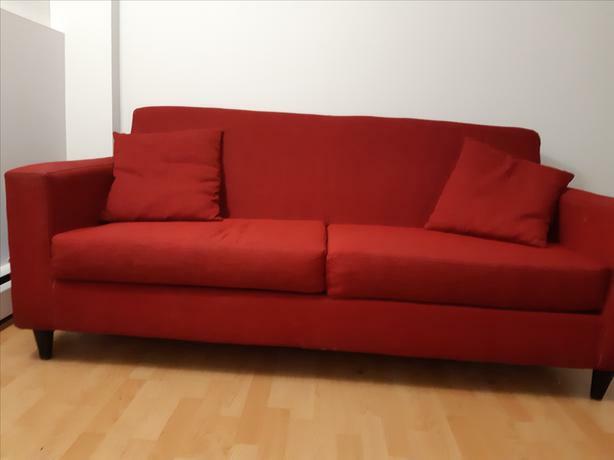 Very comfortable Red Martini Condo Sofa from Hudson's Bay. The sofa is in a very good condition (with little stains and no scratches). It has thick and comfy cushions, the fabric is very resistant and easy to keep clean. The sofa also comes with two small cushions with removable covers. The content of the sofa is made of cotton and foam. You can come and have a look before purchase. Width = 190 cm / 74.80"
Height = 83 cm / 32.68"